Chances are that every single adventure game fan knew something about this game before it came out. 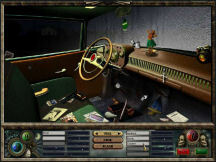 Springing as it does from the makers of many of the Tex Murphy games, it had a pedigree that made it one probably one of the most eagerly awaited products in some time. New games keep getting made, but not many from a stable with as big a reputation to live up to as this. Up front, in case you didn’t know, this is not a Tex Murphy game. However there were similarities, not least of all the same voice actor (who is also one of the makers) in the role of a private detective. In many ways though, it couldn’t be more different. To me, it was ultimately a mixed blessing. Its strengths – the script, the acting, the music – were very strong indeed. Other things – predominantly its casual and repetitive nature – were heavy weaknesses that almost dragged it under. Big Finish Games commits itself on its website to provide the very best story driven games. On the story, they certainly deliver. It blends mystery and mysticism, and hums along, each little snippet almost teasing you with what lies ahead. It twists and turns, and certainly surprised me now and then. I wanted to know what happened, which is the mark of a pretty good yarn. It is also interestingly delivered. Jess Silloway is in a dark place, with no recollection of the events that led her to be there. A man with a deck of tarot cards says he can help. As the cards are chosen, memories are triggered, and the story starts to unfold. There are seven chapters, plus an introduction and a finale. In each of the chapters, the three available tarot cards can be chosen in any order. Although each unlocks a specific memory, the script is such that, although it doesn’t always fit together perfectly, it doesn’t depend on a certain order to make sense. Certainly you might learn something that is not altogether clear, or which seems to assume some knowledge. But by the end of the chapter the pieces will fit together, if not yet into a complete picture. The tarot cards are nicely linked to the memories or flashbacks, and at the end of each chapter you can read a story summary, review the cards used and what they represent, and replay any of the flashbacks. Completing one chapter unlocks the next, and once completed, the chapter remains open to you to review should you wish or need to do so. This ensures that every player should comfortably be following the plot, however they might have caused it to be revealed, and builds a rich and many-layered tapestry. It is also very well voiced, with Jess and Merryman (the private investigator) being standouts, and the musical score is just right when it comes to setting the mood and atmosphere of what is occurring. Put all that together, and the website promise is admirably fulfilled. The website further states that you can expect intelligent, fun and meaningful game play that blends seamlessly into the story. I have already mentioned how the cards are linked to the memories, and they are further intertwined with a specific location. 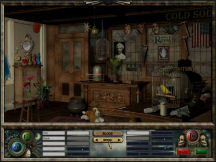 Each triggers in Jess two or three key words that are then used in that location to unlock the particular and related memory. A specific puzzle will also likely result during the chapter, one that is further related to an aspect of the unfolding story. A box may be discovered; working out how to unlock it might reveal an object of some significance. Whilst it might not be seamless as claimed, its fair to say that both the key words and the puzzles are embedded intelligently into the storyline. However the fun factor started to leave me at about Chapter 3 and by Chapter 5 it was only the story that was keeping me afloat. The key words are used in conjunction with a single screen of a particular location. My recollection is that they are all inside locations, be it a room in a building, a boat cabin or a car. In that location are numerous objects, some of which link to the key words. Say the key word was cookie – you might find a girl scout and a monster, to give you girl scout cookie and cookie monster. Each location will tell you how many of these “front” and “back” words you have to find to move on. This will be a product of the difficulty level you chose for the game. The higher the level, the more linked objects you have to find. As the game interface screen says, it’s like a hidden object game, albeit through word association. Some associations are obvious, others require a little lateral thinking to determine. You can get a certain number of clues in each location, again a factor of the difficulty level, and you are allowed a certain number of misses before you have to start the search over. The objective is to find the necessary number of objects for each of the key words in that location (generally three, but anywhere from one to four). As each chapter has three cards, each representing a location, and each location usually has three key words, you get to play this word association game about 60 or 70 times. Which for me was about 55 times too many. You also get to solve about a dozen stand-alone puzzles. Some were rather good, others not nearly so good. Spot the difference in two pictures and reassemble a torn newspaper were examples of the latter. None were terribly hard, and you can choose to skip any puzzle you like (although you won’t see the solve). That’s it for “adventuring.” A multitude of word associations, and some one-dimensional puzzles. Casual gaming writ large in my opinion, and the biggest drawback of the experience. Skipping puzzles, along with getting clues, affects your “card rating” for that particular tarot card. The end game requires you to choose two cards, and their rating will determine their effectiveness in the finale. There are multiple endings, and your choice of cards and their strength will be a factor in which ending you get. Somewhat oddly, especially given the plethora of information that you can review at most times, I couldn’t find a way to reveal a different ending without playing the whole game over. You can replay a chapter, but I couldn’t find a way to pick different cards in the finale. I was happy with the ending I got, but would have liked to have tried to see the rest. It’s a first person perspective, and everything is done by pointing and clicking. Flashbacks are little animated cutscenes, which play in a very small part of a smallish game window to begin with. Why they are so small, I don’t know. Each is preceded by a reflection from Jess. The detail in each of the locations is rather good, although some objects are very small, and sometimes difficult to recognise (pen, pin, pencil??). The short look at the outside of each location that you get before entering I liked a lot -- predominantly black-and-white drawings, punctuated by little bits of movement of colour. It helped develop the mood of the piece, especially in particular locations. The game saves automatically when you exit and you pick up where you left off. Different people can play by creating their own identities, and then choosing an identity from the menu screen. You can’t tweak settings and you don’t get subtitles. There is more to come. So don’t expect everything neatly resolved. 3 Cards to Dead Time is already in development. If you like a well told story, and if you are a fan of casual games, you will probably rate 3 Cards to Midnight more highly than I did. I want far more from my game play than this offered, although not much more from a story perspective. So a very mixed blessing indeed. 3 Cards to Midnight can be purchased from the developer’s website here.